Acting is a profession which has taken millions of people into a magic world of money and fame. There are so many legends who have been and still are worshipped as a role model for the superficial characters they perform in movies. Even though the world of acting has given the best of everything to few people, still the crowd has people who have miserably failed and lost peace. You might have possibly heard many people telling you, not to get into acting for many number of reasons. There is nothing which is assured that it might come true, but still there are incidents happened around the country which anonymously made everyone tell to not choose it as your career. 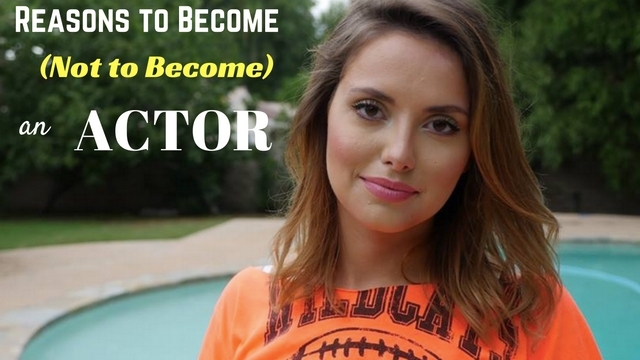 This post is all about the various reasons which insists to choose acting as your career as well as not to choose become an actor. Every human being has a dream of their own. Not all are good at same thing. There are few people who are bestowed with acting skills, lots of creativity and power to mesmerize the world by their acting skills. If acting is something which has been constantly your dream to portray to the world, then acting would be a right choice if you are well planned about your life. No one has rights to stop a person from achieving their goals of life. If you feel acting is your passion then do not hesitate to go for it. All of us know how actors are been followed and always kept in limelight. Right from the child artists to leading actors no one can escape from the media world. Frequent interviews, attending award shows, being brand ambassadors to doing promo for movies, actors are always kept in limelight. If you are someone who loves to be always kept busy or loves the feeling of being get noticed all the time, then surely acting is the best option you could do for yourself. Acting is probably an only profession where people reach the stardom in a night. If you have enough skills and luck and you are someone who wants to reach the top with single blockbuster then acting can be your choice. This is applicable to all age categories of actors, where as if something clicks out and a movie becomes a massive hit then for sure it makes the person become a star overnight. Even though this might sound ridiculous this becomes realistic only with professions like acting career. Needless to explain, money is something which the world keeps running behind. That too in profession like acting, actors are paid huge amount once if they get a break through movie. There is no certain pay scale limit or any fixed standards of income to actors. Hence, as there is no boundary and if you are someone who is determined to earn money by show casing your acting skills than acting might be the right choice for you. Good looks are must for acting career. It is not enough if we do not stress the word good looks. Yes, if you are someone who looks best and are passionate of looking good you can probably choose acting as your career. This profession demands a lot from physical appearance. A well-maintained figure, even complexion and best of physical features are some of the most expected things by audience from an actor. Hence, if you have ticked the checklist what are you waiting for? Get right into the world of entertainment. In the media industry, traveling is something which all actors are bound to do every single day. Traveling to various shooting spots is something which is very common in big screen as well as in television media. Not only traveling abroad, actors tend to travel a lot around the same country with different shooting spots. So, if you are someone who has lot of passion to travel, explore and adopt newer environments every single day, then acting is made for you. This might sound ridiculous, but it is somewhat true as acting is a good way of reaching people. There are many prominent examples like right from Arnold Schwarzenegger to George Murphy who entered politics by using acting profession as their channel to reach people. So, if you are someone who have an idea to become an actor as well as some passion for becoming a politician, choose media world as your ground. There are many reasons which stop a common man from choosing acting as their career. Here are the few most prominent reasons. Acting is a profession where you do not know how much time will it take to reach your destination. Time period is uncertain as well sometimes it takes months to get an opportunity or even years to prove yourself as an actor. Hence, if you are a person who have personal commitments, and very less time in hand then certainly acting will not match your profile. Acting can make any pauper turn into a billionaire. But this cannot be the case for all who choose it as a profession. Some days you earn enough, sometimes there are even chances that you do not have any kind of income. Your income will certainly depend upon the production company you work for as well as your role in the film. Hence if you are someone who is not financially stable, then do not take risk of choosing it as your profession. There is always a misconception that acting is a job where you need to dress up well and stand in front of the camera rolling. It is certainly a very tough job where you would be exposed to heavy lights, dramatic costumes sometimes and expected to perform your best whatever your mood might be. Humans are often affected by personal emotions and there are chances where you do not feel your best while you perform. But this will not be accepted as once you are under the camera, you need to turn yourself into the person irrespective of your mood. Unless and until if you are a person who is very hardworking and have extraordinary perseverance, do not choose acting as your career. Socializing is a part of acting career. You need to attend social gatherings, many guest occasions as well as parties. If you are a very shy person, and someone who is very much limited to own space then acting cannot be your cup of tea. This might sound absurd, but you should be aware that being always dressed up is very important in acting career. So, right from wearing pyjamas to suits, you will be expected to dress up your best. Hence, take time to judge your personality about being dressed and take a choice of career. Needless to say, be it a small time actor or a star you will be always occupied and covered by media world around with cameras. There is very little space for personal life. Hence if you are someone who loves to be aloof then think twice about choosing it as your passion. There is always equal amount of upsides and downsides for any kind of profession. Acting career is also something which has both positives as well as negatives. It depends upon an individual to choose what they really wanted to become having their limitations in their mind. Do what you love to do. Hope this post helps you to understand about the reasons to be an actor as well as not to choose it as your profession.